1. The Penguin Band tracker above is highly accurate and updates the room and server the Penguin Band was last seen in. Click here to refresh the Penguin Band tracker! 2. The Penguin Band usually logs into the crowded servers during peak hours of the day. Penguin Band visits the less crowded servers during hours when less penguins are online. 3. The Penguin Band is most commonly seen on Mammoth, Blizzard, and Frozen. Check these servers first. The Penguin Band most commonly is found in exclusive party rooms including backstage at the Stage and at the Dock. 4. The Penguin Band is usually online when they visit Club Penguin, but is not on when Club Penguin support is closed. If you notice a server that usually is not crowded suddenly get crowded, check this server for the Penguin Band. 5. The Penguin Band is four separate penguins. Each penguin will give you the same background when you find one of them. Many times all four members are found together. If you find them on Club Penguin, click on them to view his player card. 6. If you do find the Penguin Band on Club Penguin, click on the free gift button on the far right for the Penguin Band’s autographed background. 7. The Penguin Band is always very crowded when they are online. Be sure to check the users in room list instead of searching for them in the room. The users in room list is alphabetized and easier to search through. 8. Penguin Band changes servers every 15 minutes. This means you will have to find Penguin Band fast and check this page for updates. 9. Finding the Penguin Band takes a lot of patience. Use my tracker and with some time you will find Penguin Band. The Penguin Band may be on multiple servers at the same time. 10. 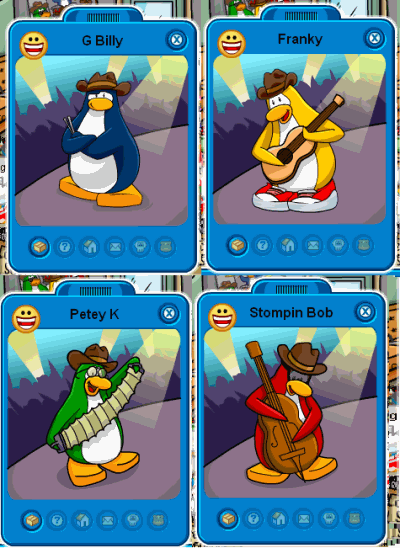 For more info on the Penguin Band, read about the Penguin Band on Club Penguin. 11. Visit Club Penguin Trackers for the official Penguin Band tracker. The page will load faster, so you can get into the room before it gets full.